Hyderabad, Mar 17: Twelve victims who went to Iraq to work there have been subjected to forced labour, verbal abuse, and threats. The victims claimed that they reached Iraq eight months ago and although initially, for the first 3 months, they were being paid for their work on time, eventually, their payments stopped coming in. When they happened to question the owner about it, the owner's son threatened to shoot them and thereupon, subjected them to forced labour. Thereafter, they have been held in captivity. Ganga Srinivas, while explaining the difficulty that he is undergoing in Iraq, said, "This is the second time that I’ve visited Iraq. I came here in the month of April last year to work in a fiberglass boat manufacturing company under the contract company named Al Maysoora Trading, which is based in Basra city in Iraq. We have not been paid since October. We have tried to request our owner several times to clear our payments but no use. To protest the injustice, we stopped working on February 23." He said, "He called us and convinced us that he would clear our dues in a few days. However, a few days later, his son Ali showed up along with his friends at our residence in Iraq. They held us at gunpoint and terrorised us to work for them. Therefore, we're now very afraid to ask the owner to clear our dues." According to the victims, when they approached the embassy for support, the owner threatened them to incriminate them in false cases and send them behind bars if they did so again. He added that a total of 12 persons from Telangana state are currently held in custody and do not have the money to come back. Out of the 12, four individuals' visas expired on March 11, 2019, and the other eight persons' visas are going to expire in the month of June. The victims have requested external affairs minister Sushma Swaraj and TS Chief Minister K. Chandrasekhar Rao to come to their rescue. 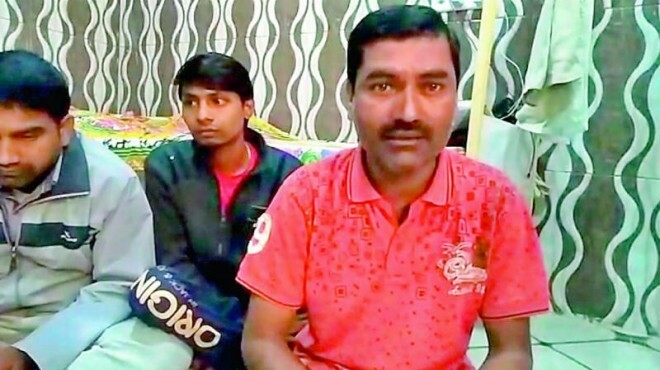 Chakali Rajeshwar from Armoor, Nizamabad district, who has a wife and three kids ages 15, 12, and 9, and is stuck in Iraq, said.....They have not been paying us for five months now. We don't even have money to buy food. What makes matters worse is that they have been terrorizing us with weapons. I haven't been able to send money back home to pay the installments of a loan which I have taken, or to pay my children's school fees, due to which my children are not being allowed to attend school now. We are working in butcheries and cold storages to get by. We have lost all hope."